Rod Stewart has announced plans for an extensive North American summer tour. Following the incredible success and rave reviews for their 2017 summer tour, Stewart has invited the legendary Cyndi Lauper to again join him as the tour’s special guest. Produced by Live Nation, the 22-date tour begins June 25th at the Hollywood Bowl in Los Angeles, CA with performances scheduled at some of the most storied venues across North America including Madison Square Garden in New York on August 7th, Bridgestone Arena in Nashville on August 1st, Budweiser Stage in Toronto on August 10th, Shoreline Amphitheatre in San Francisco on August 29th and more (complete itinerary below). Pre-sales begin Tuesday, January 9th at 10 am local time; tickets will go on sale to the general public starting Friday, January 12th at 10 am local time via livenation.com. 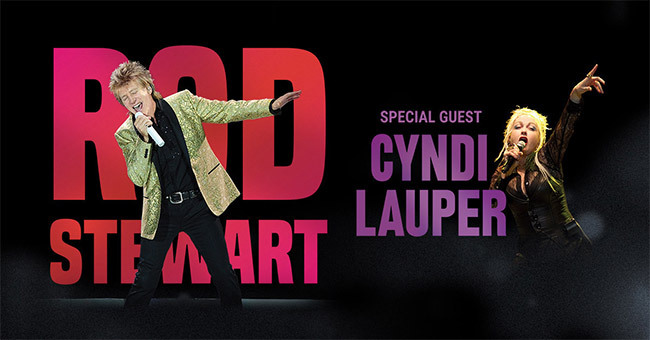 Citi is the official pre-sale credit card for select markets of the Rod Stewart with Special Guest Cyndi Lauper tour. As such, Citi cardmembers will have access to purchase pre-sale tickets beginning January 9th at 10 am local time until Thursday, January 11th at 10 pm local time through Citi’s Private Pass Program. American Express will hold a pre-sale for tickets to the Hollywood Bowl concert only.